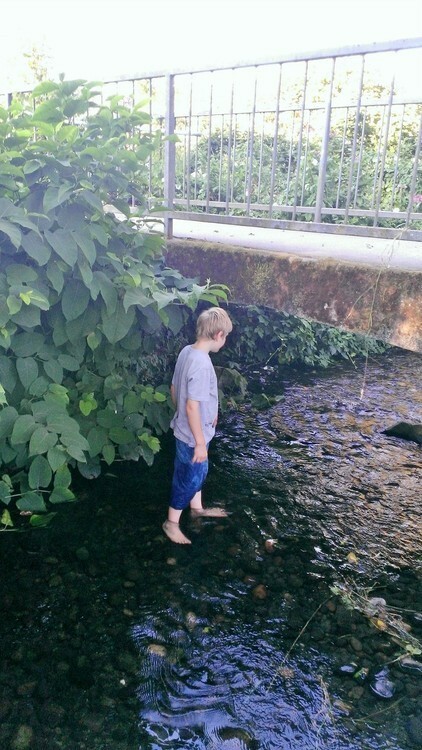 My son loves the water. Always has. We enrolled him in a Waterbabies class when he was less than a year old, and swimming quickly became his favorite activity. Where other children thrashed around in a semi-panic as their parents towed them around the pool, my kid was squealing with delight. Indeed, the only time that the histrionics were deployed was when I announced that it was time to leave. 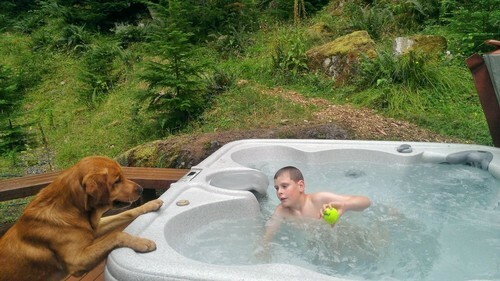 Exhibit B: when we visit the family cabin he spends much of his time in the hot tub, throwing a tennis ball for a neighbor dog and then splashing about until it is returned. Add to this his leisurely baths, and I became convinced that submersion in water soothed him. This fits with our general observation that he enjoys pressure of all kinds. When he wears a tight-fitting Lycra shirt, he seems somewhat calmer. I will sometimes enter his room when he is supposed to be sleeping, only to find him between the fitted sheet and the mattress. And he is a big fan of beanbags, though he is more likely to be found under rather than on them. As he’s gotten older, however, I’ve come to realize that he simply enjoys being drenched, and isn’t particular as to how that happens. Sprinklers work as well as pools, and his showers drag on as long as his baths. He is unfazed by rain and thrilled by puddles. When we send him to camp, we always tell his aide to keep a close eye on him if they go near any source of water, and he returns home soaked regardless. His favorite place is the beach, and we visit it as often as is practical in the Pacific Northwest (although his Scandinavian heritage allows him to joyfully endure the water for a few weeks after most Seattleites have deemed it too cold). Earlier this year we traveled to Hawaii and attended a wedding a few feet from the surf. I was certain that he would bolt into the waves in the middle of the vows, but some previous visitor to the beach had excavated an enormous pit in the sand and he spent his time playing in that. Only after the ceremony, when we gave him the go-ahead, did he at last rush into the water, fully-clothed, to the amusement of all. Perhaps the most unusual side effect of his hydrophila is his enthusiasm for H2O: Just Add Water. It is the only story-oriented television show he watches, and even here he doesn’t really follow the narrative, instead skipping around until he finds scenes of the protagonists swimming. It’s all very charming, until I pull up Netflix in front of friends and have to explain why my “Recently Watched” queue is entirely populated by an Australian soap opera about mermaids that is intended for tween girls. I never thought about it before but perhaps that is why Squiggle is so in love with the movie “Finding Nemo” All in the water. A friend with a child with ASD got some yardage of bathing suit lining material and sewed it into a tube that fit over a twin bed. That way her child could slide between the stretchy fabric, but still keep the bed made. For Netflix I created a separate profile for my son so that his Arthur and Curious George episodes don’t mix in with mine. 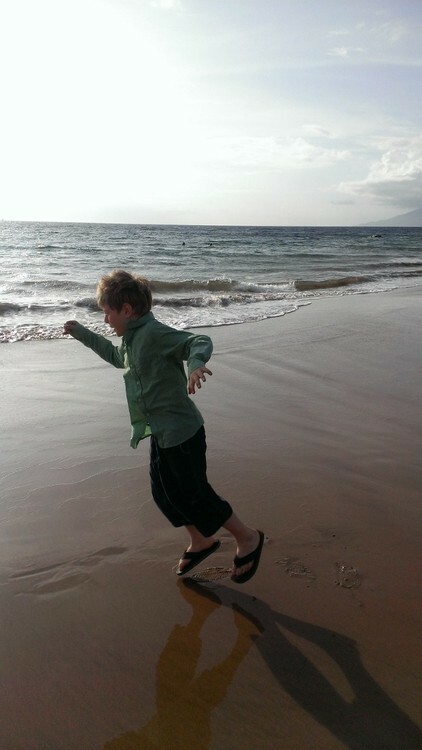 Yup, my son now gets into cold sea water much faster than I do. Makes me look like such a wuss.